The price of policing the North Dakota Access Pipeline has been tallied at $22.3 million, a cost that North Dakota is not happy to pay. In total, the report says that $22.3 million of state and local taxpayer funds went to supporting the policing effort, with 91 different state agencies from nine other states providing support. The amount is $5 million more than the entire state set aside last year, and it could fund the state treasury for more than two decades. According to the report, the money was spent on 181,232 hours of policing over a period of 153 days. In that time, 581 protesters were arrested, 94.9 percent of whom came from out of state. Of those arrested, 182 had a prior criminal record, with 25 of those having a history of violence, including any history of domestic violence or child abuse. All of the protest-related costs were decided by the state lawmakers, but North Dakota state representative Jeff Delzer (R-8th district), chairman of the state house’s appropriations committee, says state officials want the federal government to help pay for the costs. In response to the protests, then-Governor Jack Dalrymple (R) issued an emergency declaration under the Emergency Management Assistance Compact (EMAC) to ask for assistance with the protesters. The bill, which was passed by President Bill Clinton in 1996 in response to devastation caused by Hurricane Andrew, was originally intended to allow states to ask for assistance with natural disasters, not protesters. EMAC was also used by the police in Baltimore during Black Lives Matters protests in 2016. Officers from Pennsylvania and New Jersey were sent to assist, and afterward the state of Maryland fully compensated the out-of-state officers for their time and effort. When Indiana agreed to send officers to assist with the DAPL protests, Griffith Police Chief Greg Mance said that their agreement included payments for “all wages, overtime and cost of benefits to the officers, meals while the officers are on duty, a per diem while they are off duty, lodging for the officers during their time of stay and mileage reimbursement for the communities who sent vehicles,” according to the Northwest Indiana Times. 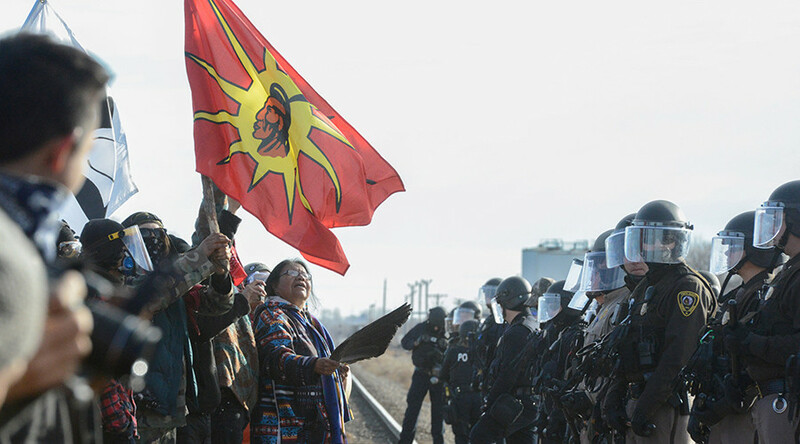 After months of violent clashes with the police, which were reported as “very aggressive” and caused 167 demonstrators to be injured, the $3.8 billion pipeline, which was planned to go through four different states, was put on hold. Along with the money spent on policing, the report also details that 50 to 75 cars or structures were abandoned on the site of the protester’s camp, as well as one bull, two horses, three bison, four cows getting killed, while two cows were injured and 30 went missing.